Many of us use proxies, in fact if you have internet access at work or college it’s almost guaranteed. 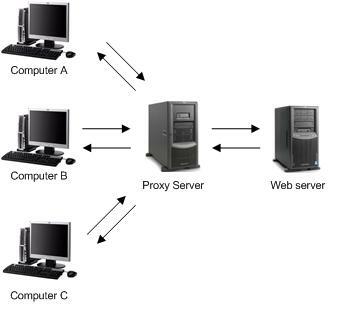 A proxy server is an intermediate server that sits between a client and website or application, forwarding and receiving data. The primary function in a corporate network is to provide a central gateway for accessing things like internet access. If all web requests are relayed through a single point it’s much easier to protect and administer than hundreds of individual connections. Out in the internet though proxies have more distinct roles, primarily being used to provide anonymity and bypass the various online filters and blocks that are increasingly common. The basic idea is that if you route your internet requests through a proxy server then the site you visit has no record of your IP address. Furthermore any regional blocks which are applied, such as media sites like the BBC, can be bypassed by using a proxy in the required country. Proxies are also used for supporting all sorts of automated software which people use all the time. Programs which do research, internet marketing tools and a whole host of other automated programs which require multiple connections. The problem is that if you use these tools with a single IP address it will usually get blocked or blacklisted very quickly hence the need for proxies. What’s Different about a Residential Proxy? There’s actually only one significant difference between an ordinary proxy and a residential one and that’s the IP addresses it is assigned. Your standard proxy will be allocated IP addresses from a commercial or educational range, especially if it’s based in a datacentre or educational centre. However these ranges are very often blocked by commercial websites automatically. For example in 2016, Netflix started to block access to all non-residential IP addresses in attempt to stop people switching between the different versions by using proxies and VPNs. All IP addresses are classified in this way, and residential addresses are normally only allocated by ISPs to home users. So a residential proxy is basically a normal proxy server which has been allocated residential IP addresses. This is the reason they are generally much rarer and can cost quite a lot as the addresses are extremely difficult to obtain. The advantage is that residential proxies are very difficult to detect and are unlikely to be blocked if used properly. Indeed, the only way a residential proxy is normally blocked is if an individual address is overused. Normally you buy residential IPs in large blocks as one or two is not going to get you very far with any sort of automation. They are very much in demand, and it can be quite difficult to find residential proxies for sale. Mainly because there are so many different uses although if you’re just after one address to use to access something like Netflix then you’ll be better off with one of the residential VPNs which are available. If you’re running things like Sneaker or Ticket Bots, SEO tools, Social media posters or research programs then you’re going to need a block of addresses to rotate through automatically. The safest method to protect these expensive IP addresses though is to use them through a backconnect proxy which rotates through different servers and configurations automatically. If you’re looking for a decent source of these residential rotating proxies then there’s actually only a limited choice. One of the main options you might find is something called the Illuminati network, be careful with this as these ‘proxies’ are merely computers where people have installed a free version of a VPN system called Hola. Many of these individuals have simply not read the terms and conditions and will be unaware that their bandwidth is being resold! There are a couple of more legitimate residential IP provider companies however. The company who has the largest residential address network run on their own hardware is below, they know exactly how to create a residential proxy and how to keep them safe. Whatever your budget or requirements for private residential proxies you should find something to suit your need with them Most importantly they have a 48 hour refund guarantee if you want to try them out, they do honor it.